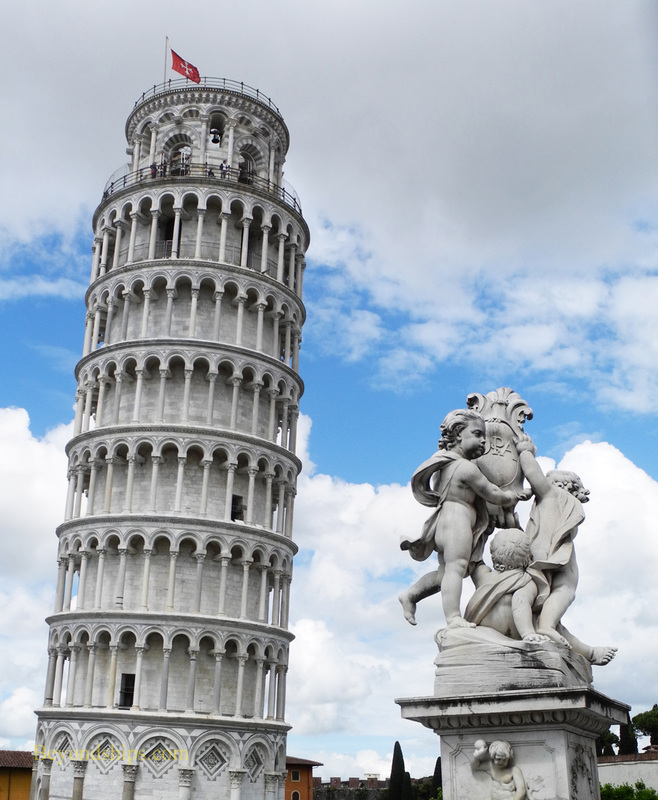 The Leaning Tower is one of the world's most famous buildings. Its image has become a symbol of Italy. Seeing it in person is somewhat startling like walking down the street and recognizing that the person next to you is a famous movie star. It is a pretty tower with nice proportions. The cylindrical body of the 186-foot Tower is embellished with arcades and delicate columns. However, the principal reason for its fame is its list. Begun in 1173, the tower was built as the bell tower for the Cathedral. Eventually, the Tower would be home to seven bells, one for each note in a major scale. 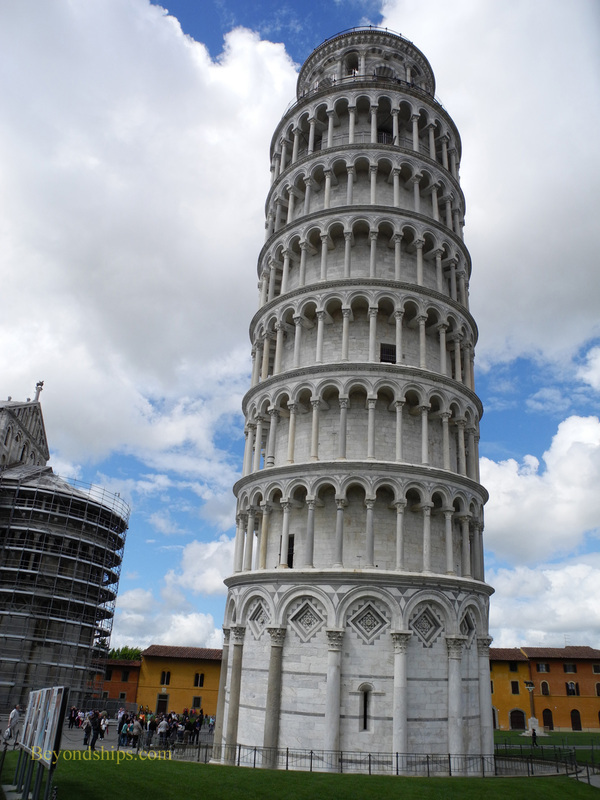 Shortly after construction began, it was realized that the Tower was leaning. This was probably due to the inadequacy of the foundation and the sandy soil of the Field. Construction was halted after only two stories were completed. Due to wars and civil strife, the construction did not resume for a century. However, the long delay had allowed the soil to settle to some extent, making it possible to continue to build. The lean is not so pronounced from all angles. Today, the angle of the list is about 4 degrees - - an improvement over the 5.5 degree list of a few years ago. The counterweights and the cables used during the rescue efforts are now gone and the Tower is open to the public. Visitors can climb the 293 steps to the top but only as part of a guided tour. To compensate for the list, subsequent stories were built with one side higher than the other. Thus, the Tower actually curves. The seventh story was completed in 1319 and a Gothic-style bell chamber was added in 1372, completing the structure. However, the Tower continued to list. The movement was very slow but by 1838, it had progressed to the point where a major effort was undertaken to preserve the tower. Nonetheless, by the second half of the 20th century, it again appeared that the Tower was in danger of collapse. Following years of study, the Tower was closed in 1990. The bells were removed in order to reduce the weight of the top levels and weights were placed at the base on the raised side to offset the list. Then soil was removed from under the raised end in order to straighten the Tower back to the angle it had had in 1838. More soil was removed in 2008, which it is claimed has stopped the Tower from moving for the first time in its history.